Register Now for the May 2019 Emulate3D User Group Meeting! Test your control system operational logic in the office. Develop, test, and produce robust PLC and mid-level control systems offline, before building the real system. Building a Dynamic Digital Twin? Controls emulation saves time and money by testing the control system before going on-site; shorten the project's critical path with virtual commissioning and reduce overall testing time. 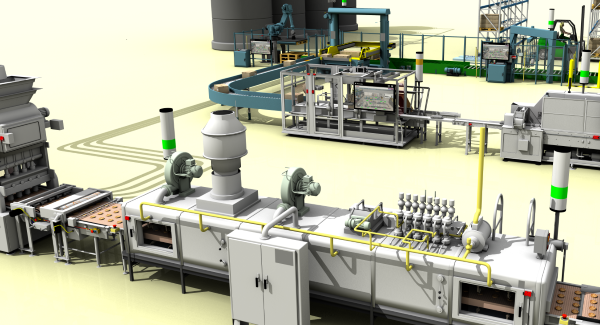 By using a 3D model to provide realistic feedback in place of the real automated system, operator training becomes safer, cheaper, and does not disrupt existing production. Emulate3D Controls Testing simplifies your control logic testing. Create controls testing models of your machines directly within your CAD system. Debug and refine the kinematic sequences and timing of your designs in a virtual environment, and make changes faster than is possible with physical prototypes. Create your machine or mechanical system in CAD, mark up the various kinematic and control elements, add a load source if the operation is triggered by the presence of products, then connect to the PLC IO to run the emulation model. Combine mechanical CAD information with real control system logic to create a valuable test bed in the form of a Dynamic Digital Twin. Analyze system throughput, identify bottlenecks, dimension layouts accurately, and test out different operational modes to increase your understanding of how a system responds to changes. Bring "what if?" scenarios to life and compare results to select the best configuration and functional parameters to meet your objectives. Sim3D helps you to reduce the risk associated with your project decisions by clearly demonstrating the consequences of system design choices. Take better decisions based on repeatable simulation analysis, and produce better outcomes. 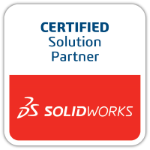 Sim3D is an essential part of your engineering toolkit. Build impressive and accurate demonstration models, create CAD layouts, and generate a bill of materials from plug and play catalog elements in time for those project discussion meetings. Communicate your solutions with clear and memorable videos which guarantee your proposal will be discussed long after the initial presentation is over. Help your clients to experience your solution interactively within a Virtual or Augmented Reality environment. Demo3D's unique build approach makes the development of dynamic sales models cost-effective, and allows your prospects to envision your proposals realistically and unforgettably. How can Emulate3D technology help you? Request a Free Demo Now! We want to show you what our technology can do to help your company be more competitive, more productive, and more profitable. Our solutions may be a great fit for your company, and the best way for you to decide is to know more, and here is where you'll find out how. Register now for the next online Workshop to get started. Learn the basics in five interactive sessions with an experienced trainer leading you through the product. The next Workshop begins on Monday April 22nd. 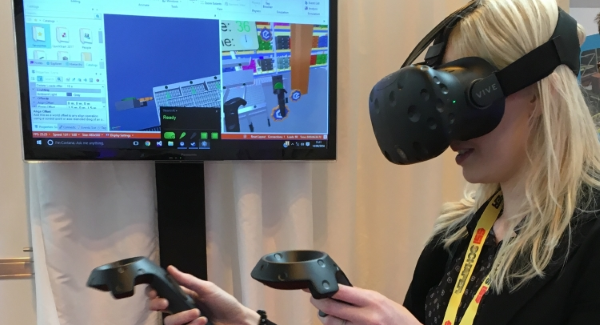 Virtual Reality immersion is an astonishingly effective way to enable you to demonstrate layouts and running models, interact with control systems, and communicate your solutions to remote stakeholders. Emulate3D's VR technology now includes Microsoft Hololens, HTC Vive, Microsoft MR headsets, Meta 2, Oculus Rift, Samsung Gear VR, and Google Cardboard - all accessed at the touch of a button. Create genuine excitement among people who should know better by showing your solutions in immersive VR and AR - available today. Learn about Emulate3D VR and AR here! If you design, build, analyze, or implement automated systems or machines, Emulate3D can help you. Emulate3D technology saves time and money at commissioning, helps you to analyse product flow, and enables you to create unforgettable industrial animations, really fast. 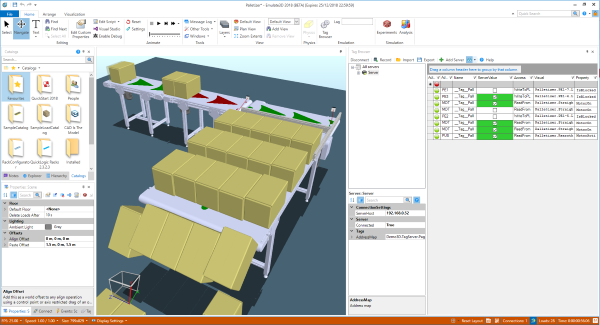 Emulate3D products are used by people who work with warehouses, manufacturing and production systems, airport baggage handling systems, packaging systems, machine designs, automotive systems, and many more. These videos give you some idea of what's done on a daily basis with Emulate3D technology, and if you'd like to find out how easy it is to try it out for yourself, give us a call on 801 923 3316. Watch our videos and subscribe to the channel!